Before I started making leather goods, I had no idea what types of leathers existed. I knew about Horween Chromexcel, because of my Wolverine 1000 Miles. I knew something about bonded leather being bad. But other than that, I figured leather was leather. To keep it simple, I use the top quality, full grain leather. I purchase leather by the side (the actual side of the cow) and cut it as needed. There are two types of “tanning,” transforming the leather from animal skin to a durable material. The two types are Vegetable (Veg) tanned and Chrome tanned. As the name implies, veg tanned leather is tanned with tannins found in bark and plant material. The typical veg tanned leather is a pale brown. It can be left natural which will develop in to a dark brown patina. It can also be dyed it any color. 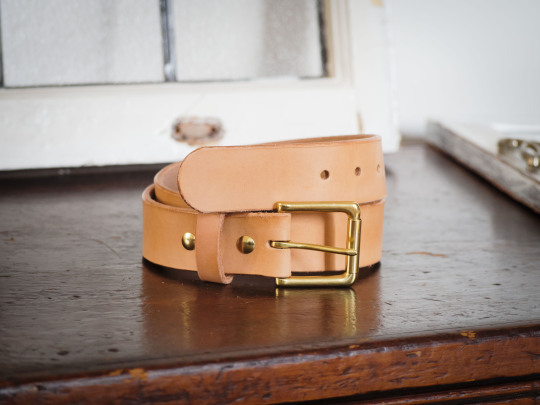 I use veg tanned leather on a belts and some camera straps. Chrome Tanning involves tanning the leather with a variety of chemicals. Its is a complicated mixture that you can find on Wikipedia. Most garment leather is chrome tanned. For the purposes of this discussion, the important part of chrome tanned leather is the additional step in the process called Hot Stuffing. After the actual tanning process, the leather is bathed in a mixture of oils, fats, and waxes which bonds to the leather on a chemical level. This creates a soft and durable leather which has the added benefit of pull up. Pull up is what happens when the hot stuffed chrome tanned leather is bent. The oils come to the surface and cause the bend to change in color. This results in an ever changing piece which grows in character as it ages. Some types of hot stuffed chrome tanned leather are Chromexcel (Horween branded), Latigo, and Crazy Horse. I use hot stuffed chrome tanned leather on camera straps, belts, key chains, bracelets...pretty much everything!